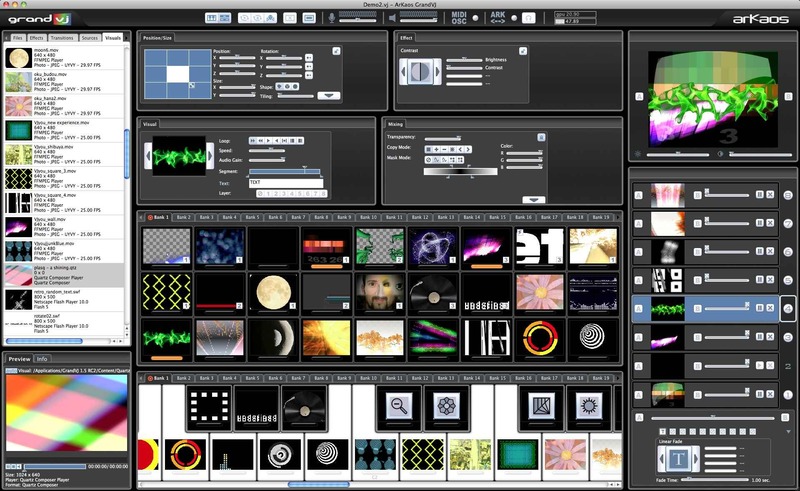 GrandVJ 1.5, VJ Software from Arkaos. ArKaos, the world-leading provider of technology for live visual performances, is pleased to announce the release of GrandVJ 1.5, which includes major new features and enhancements. 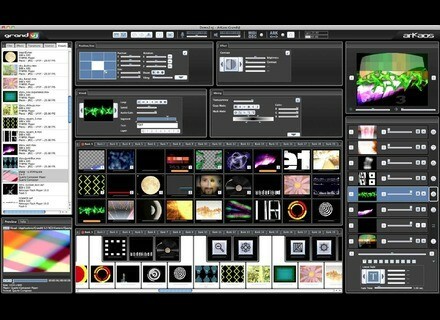 With the addition of 37 transitions, it’s even more fun to mix with GrandVJ 1.5! Each transition can have up to four parameters plus a fade time, all of which can be controlled through MIDI. In Synth Mode, the new transitions add fabulous fade in/fade out between visuals. In Mixer Mode, users get advanced live control on the transitions through the A-B mixer. ArKaos Connect allows GrandVJ to receive sound and MIDI from any audio sequencer compatible with VST plug-ins, running on the same machine or on another machine from the network. ArKaos Connect has been successfully tested with Ableton Live, Steinberg Cubase, Cakewalk Sonar X1, Reaper and FL Studio. Incredibly easy to setup, the plug-in configures itself automatically! For VJs, ArKaos Connect enables a new level of interaction with Musicians. For Musicians, ArKaos Connect makes it fun and easy to add a video track to compositions during live performance. The browser now allows the user to preview visuals, effects, transitions and sources before displaying them in the output window, just like a DJ would listen a track before playing it to his audience. Akai APC 20 Support with MIDI feedback. GrandVJ 1.5 brings bidirectional support for Akai’s new MIDI controller, the APC20, through a dedicated template, just like for the APC40 in the previous release. GrandVJ will now accept most acquisition devices under Mac OS X thanks to the added support for QuickTime Sequence Grabber and QT Kit. Enhanced Multiple Monitors Support on Windows. Under Windows 7 it is now possible to use multiple monitors from a graphics card with several outputs, even when the spanning functionality is not available, as it was under Windows XP. The new colour pass filter transforms a coloured visual into a grayscale image, allowing only one colour to pass through. Four parameters can be used to select the colour range. GrandVJ accepts all common video and image formats. Its intuitive interface lets you turn your keyboard into a super controller for zipping through the functions. Behind the scenes, GrandVJ speeds up with a state-of-the-art multi-threaded hardware-accelerated graphics engine that benefits from ArKaos experience of more than 10 years in live visual processing software development. It can play video at up to 60FPS without dropping a single frame thanks to Software Genlocking and supports Frame Blending and Soft-Edge without any compromise on output quality or software stability. Grand VJ has been developed, tested and refined to get the best possible performance out of any modern computer or laptop, and just like all other ArKaos products, GrandVJ runs on both PC and Mac. ArKaos is a world leading developer of real-time visual processing technologies for live visual performance. The company develops visual synthesizers that trigger and manipulate graphic content for display on large screens at concerts, clubs, etc. Founded in 1996, ArKaos started as a software company but today it also develops the ArKaos A10, a unique hardware media server that delivers an unrivalled performance in speed, effects and manipulation of simultaneous high-definition video streams.